Green Gift Box. Zoppini and wholesale. Miniature black – painted gift box with gold toned accents. The image is raised in bright enamel upon a shiny support. Of course the gift box is for something special and a little ribbon adds a nice touch. 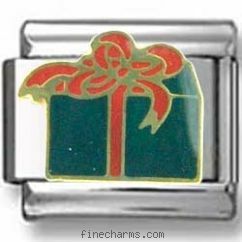 The charm is made from nickel-free stainless steel and is fixed to a medium size. Holding everything from candies and nuts to bath salts and soaps, our box will make a distinctive visual impression on many friends and create a holiday spirit on your bracelet.